Have you ever visited the CafePress website? CafePress is your source for unique and personalized gifts – for any topic, interest, or brand! I could literally spend hours searching through their unique designs. You can find pretty much anything you want there. I was super excited when I was given the chance to review a t-shirt and an apron from CafePress. The hardest part was knowing which designs to choose. I am very happy with this apron. It is thick and keeps me from getting wet when doing the dishes and keeps my clothes from getting splattered while I cook. It definitely gets two thumbs up from me! Yes, I'm a Twilight Mom! The shirt is great quality, feels wonderful on me, and I got numerous compliments on it when I wore it yesterday. 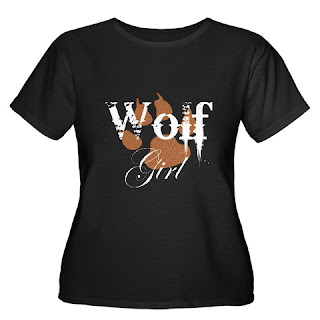 I must give CafePress huge props because they have an awesome selction of plus sizes. I've had a hard time finding shirts from my favorite movies and television shows that would fit us larger folks. Thanks to CafePress this is no longer a problem. This shirt is a hit with me! So, are you wanting some CafePress gear of you own now? Well, I have good news! One lucky reader will win their choice of apron AND a t-shirt! All you have to do is go over to CafePress, look around, then come back here and leave me a comment on which designs you would choose if you win. This is mandatory for entry. *Become a fan of CafePress on Facebook. * Blog about this giveaway. It doesn't have to be a whole post, you can just mention it when you are posting about other giveaways if you wish. Just be sure to include a link back to here. This is worth 5 entries, so leave 5 comments. *Add my button to your blog. This is worth 5 bonus entries, so leave 5 comments. Please leave a comment for every entry you do. Be sure I have a way to contact you if you win. Deadline to enter is 11:59pm CST on Monday April 26th. I will email the winner and they will have 72 hours to respond, or an alternate will be chosen. Good luck! 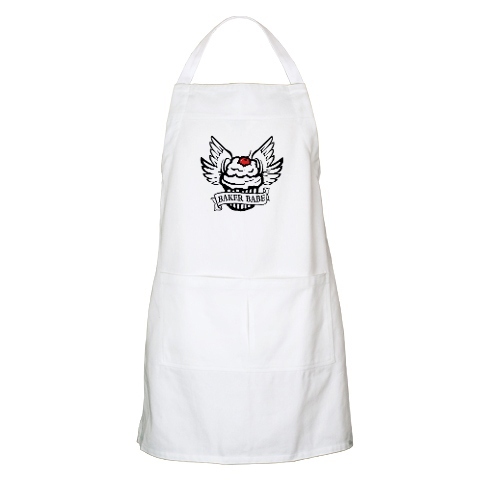 I love the woodstock on a tee apron. I follow or subscribe to your blog. I'd like the design that says: Give me the Icecream and No One Gets Hurt!! I like th peace love schnauzer tshirt. Become a fan of CafePress on Facebook. Apron & for the t-shirt one of the 1957 chevy styles. I LOVE Cafe Press - they have everything! My perfect apron would be Math vs. Politics BBQ apron in Khaki and my perfect tee would be the "Math" Jr. Spaghetti Tank in Light Blue, size small. I would get the organic womens fitted t-shirt. I would get the 'I feel a sin coming on' fitted tshirt and the 'why yes, I am a ninja' apron. Funstuff!!! would choose a twilight one! I follow! Thank you! :) Hope I win!! I follow CafePress on twitter, username slowclublover. I would choose the Pie Hole design from Pushing Daisies! I would pick the Chihuahua Making Faces Dark Women's Tee in black. I'd pick any one of their cute dachshund designs. I feel a sin coming on... that is so funny I would love that on a shirt or apron! Melanie Calcut is a fan of CafePress on Facebook. I like Im the little brother T-shirt and the Giraffe BBQ apron. My favorite is Pale is the new tan Dark T-Shirt.